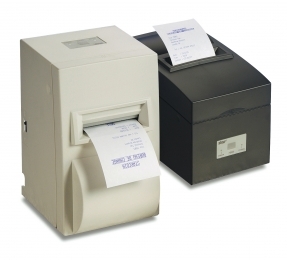 The Star SP500 is a top-quality 9-pin dot matrix receipt printer at a great price-performance ratio. Its fast output of 7.5 lines per second makes it the ideal choice for printing receipts and tickets in hospitality, POS, at kiosks and in the financial sector. Thanks to its bi-directional Logic-Seeking feature, it boasts an exceptionally high output capability. The SP500 can accommodate roll widths of 58 or 76 mm, can process journals with up to three layers, and is the perfect solution for creating economical, small receipts and tickets. Its special casing protects it from liquid spills. Included standard are also protective covers for its power supply cables, plus an integrated power supply for many years of operation, even in the kitchen or in bars. Optionally available is a kiosk version with paper rewinder, tear-off edge or paper cutter, to give you more operational flexibility. Its compact footprint 140x163 mm allows it to be used upright or horizontally, with an optional wall mount available. It also comes equipped with either serial or parallel interfaces, or with an exchangeable USB or Ethernet interface. All of these features allow the SP500 to integrate itself easily into every system.